Paiste 2002 Giga Bell Ride 18"
First CD recorder system microphone in the world designed exclusively for the acoustic piano,Compact and affordable, it offers exceptional recordings in virtually any environment - on any piano. New generation of supports, Ergonomic fastening mechanism, easy and quick assembly. Adjustments in short intervals that provide a large number of positions. Rear rubber covers adjustable to the width of the keyboard. The maximum depth of the support is 350 mm. Typical quality characteristics of K & M. solid workmanship and high quality finishes. 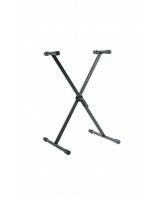 Sturdy double brace X-Stand, securely holds large keyboards. Made from steel tubing. Because of the unique height adjustment mechanism the stand always opens to the desired height and width. The best support X. Comfortable and extremely resistant. The new double support design provides perceptible stability and safety. The ergonomic fastening lever facilitates installation. The metal seal provides a multitude of different positions. Rear rubber caps adjustable to the keyboard width. Depth of 350 mm. Expand option for a second keyboard.